Wednesday night SP's family gathered at Bahama Breeze to celebrate Googer's birthday. This was also a chance to have a birthday dinner with EPAS and her family since they are in town visiting. There were 10 of us (Slarb & his family couldn't make it). Googer, Zurdie, ZSO, and the 2 nephews were at the table for 6 while SP & I were at the table for 4. EPAS sat 'in-between' on the 'bench' lining the window wall but mostly at the table for 6. Not sure why Bahama Breeze didn't push the tables together - ? On the plus side, our table was ready when we arrived. The last time we went there, we called ahead/made a reservation for 10 for a specific time and we still had to wait nearly an hour for our table. Bahama Breeze is not one of my favorite places. On a good stomach day I am hard pressed to find something tolerable. I immediately rule out anything with garlic, jerk seasoning, spicy flavor, beef (I don't eat beef at restaurants), chili peppers, beans, seafood (other than shrimp and crab), corn... just to name a few 'bad for tummy' foods. All of the above listed items have in the past and likely will in the future upset my stomach. Avoiding the above listed items severely limits my choices. Now add in 4 days of intense stomach cramping and pains with bloating and the fact that none of my various bottles/pills of over-the-counter antacid, anti-gas, heartburn, indigestion medicines seems to be working and the menu is pretty much limited to one item: my usual choice of Grilled Chicken Cobb Salad. The salad comes with 2 dressings, both on the side: blue cheese and Island vinaigrette. I like both, but blue cheese is one of my favorite dressings so I usually use the blue cheese dressing. It's a pretty good salad with chicken, lots of big bacon bits, diced tomato, shredded cheese, pumpkin seeds, avocado, egg, and greens. It's nice that it's mixed greens and not iceberg lettuce! 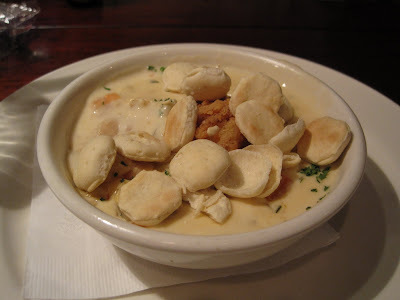 SP started off with a cup of seafood chowder: He dumped his package of crackers in before I had a chance to take the photo. 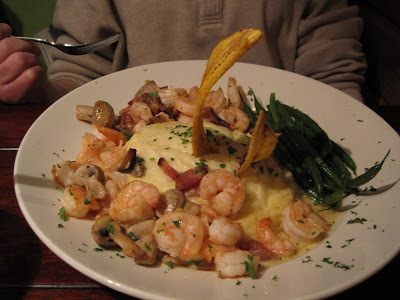 For his meal he had the special Shrimp & Grits: There were a lot of shrimp surrounding a large mound of grits and some green beans. He said it was quite tasty and large - he brought half of it home. 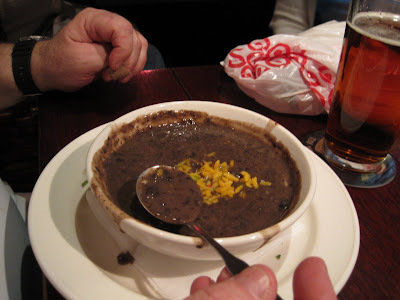 SP's dad started with a cup of black bean soup: And he had Margarita Chicken for dinner: Husband of EPAS ordered the ribs in a guava BBQ sauce: He said the ribs were good but he's had better, which isn't surprising considering that they lived for several years in South Carolina and that he has been traveling for work to Austin, TX a lot in the past 4 months. 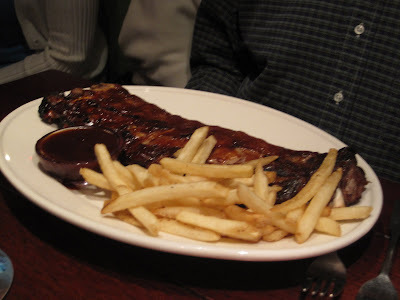 The ribs come with French fries; no veggies, so maybe not the healthiest meal. I personally would like my BBQ with a side such as cole slaw or creamed spinach. 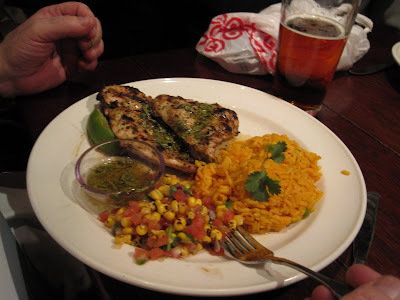 It should be noted that Husband of EPAS almost fell out of his chair laughing at me taking photos of the food. He didn't know about the blog until tonight and was amused by photo taking. EPAS ordered the Shrimp & Grits and said they were tasty, but not as good as the grits she ate when they lived in SC and in VA. I didn't see what anyone else ordered since they were far, far away! I was at the far end of the table for 4. No one ordered dessert. In spite of my stomach distress, it was a very nice evening with family. As for Bahama Breeze, I am not a good person to 'review' this restaurant. They simply do not serve foods friendly to Yum Yum's tummy. I do enjoy the onion rings, but didn't want anything fried tonight because of my stomach. One time I ordered a lobster ravioli dish and it was disappointing - not that many ravioli and neither the quantity nor quality could justify the price. For $2-$4 more I would much rather eat at Bistro 19 or somewhere like that. SP's family enjoys the food there so I'm sure there will be many more return trips there. 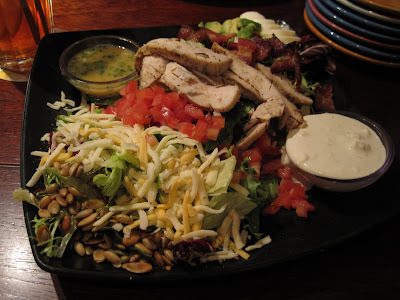 I'll just stick with the Grilled Chicken Cobb Salad -- and it's only $9.99!!! When we go to Bahama Breeze, I get the Cuban Sandwich. I think I like Cuban sandwiches, but they upset my stomach, too. I've never made them at home, which I have been wanting to try to see if its just the restaurant or the meal itself. I think I like Bahama Breeze for their "beachy" drinks. Though, you can get blue or mango drinks anywhere.